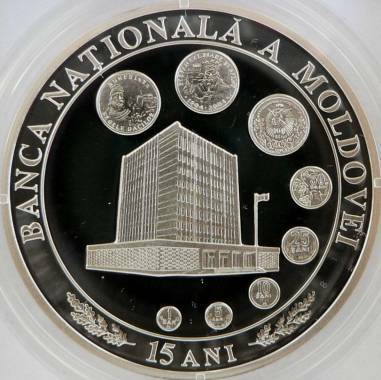 year 2006, circular inscription REPUBLICA MOLDOVA meaning "REPUBLIC OF MOLDAVIA" and the coat of arms of the Republic of Moldavia, in exergue denomination "100 LEI" the building of the National Bank of the Republic of Moldavia, surrounded by eight coins, circular inscription "BANCA NAŢIONALĂ A MOLDOVEI" meaning "NATIONAL BANK OF MOLDAVIA" and, between two oak twigs, "15 ANI" meaning "15 YEARS"
The coin is dedicated to the 15th anniversary of the establishment of the National Bank of Moldavia. 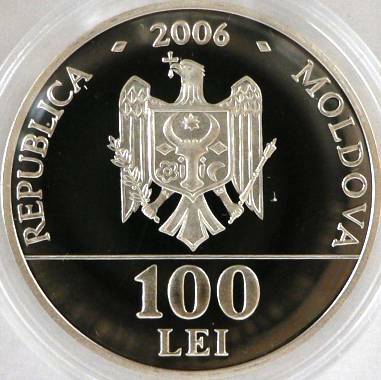 In 2011 another 100 lei coin was issued for the 20th Anniversary of the Establishment of the National Bank of Moldavia. 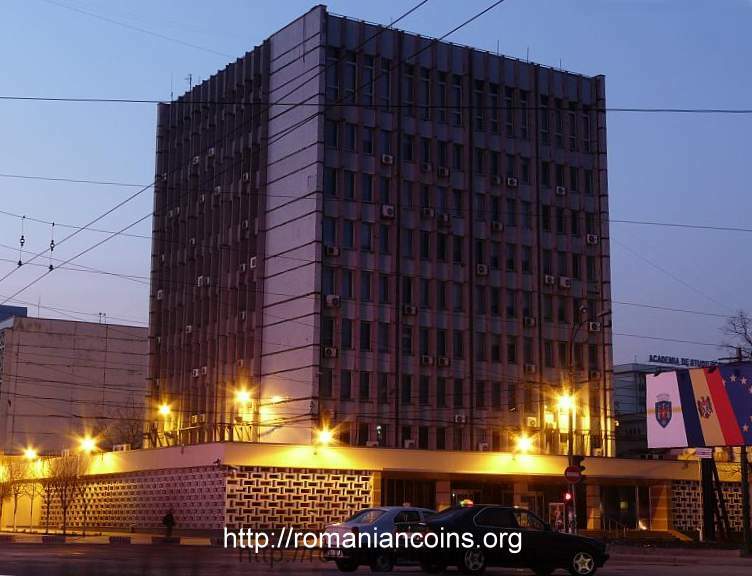 On the coin reverse are represented several commemorative and circulation coins issued by the National Bank of Moldavia. The following coins are pictured (counterclockwise, starting at 6 o'clock): 1 ban, 5 bani, 10 bani, 25 bani, 50 bani, 100 lei silver 1996 - 5th Anniversary of the Independence, 100 lei gold 2004 - 500 Years from the Death of Stephen the Great and 100 lei silver 2006 - Burebista, King of the Dacians.